This blog post is my homage to a photographic era of yester-year, the days before anyone had even heard of a little program called Adobe Photoshop, back when making a digital scan of your photo meant purchasing THOUSANDS of dollars in special equipment. 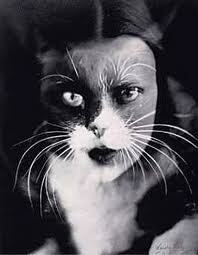 This didn’t mean people didn’t do crazily creative things to their images, Man Ray was creating images like his one titled “Kitty” over 60 years ago. Photo by Man Ray circa mid-1900s. Think about doing this one without photoshop. Obviously special effects for the sake of the effect don’t make the images better, but in the world of creative expression every tool has power, and this post is all about creating images with three simple tools. A camera, a lens, and a flash. Here’s the challenge, I’m going to post three images, each one was created in-camera with only limited cropping and color correction in Photoshop. If you think you know the techniques I used to create them then post your guess in the comments! To make it fair I posted a full equipment list I used for each image. Hint – I did not use a fog machine and color effect was created in-camera. Canon 5D Mark II, Canon 70-200 f/2.8L IS USM, Elinchrom 300RX Monolight, Rotalux Midi Octa by Elinchrome (53″), Pocket Wizard Multimax 32 Channel (2), additional ambient light (regular ceiling light bulbs) were on. Hint – The subject is parallel to the back of the camera so a large aperture isn’t enough to create this effect. Hint – This was created with one click of the shutter. These results would be pretty easy to accomplish in photoshop, but pretend you’ve never heard of Photoshop and explain how I accomplished these inside the camera… it’s not very hard by the way! Just label your responses 1, 2 and 3. Once enough people get it right (could happen quickly) I’ll post a full explanation. Good luck! 3 – multiple exposure with use of tripod. My guess is esentialy the same for all three. double exposer. its obviously true for 1 and 3 but i think #2 could be done on two different frames and then combined in the dark room. I only have a guess for #3. The room was dark, and you flashed 3 different times with a slow shutter speed, and she moved between each flash? #2 Handheld tilt shift (the vignette suggests this to me)? 3. Long exposure, multiple pops with the flash. 1- Long exposure + flash when she’s in the air. For the orange effect and lack of contrast, i’d go with a flash flaring in the lens. 2- Lens not attached to the body and tilt with the hand. 3- Long exposure + 3 flash pops while she’s moving. One of you is pretty close, one of you is very close (maybe even exactly right), and Carlie – well Carlie wins for the most entertaining guess! I’ll post the results soon, feel free to keep guessing! 1. color settings of camera. this is not just a warm kelvin thing, but also changing the color tones in the color grid of the camera (can’t recall what’s it called without it in front of me). 2. indeed a good smear of vaseline or nose wax 😉 on lens or filter. otherwise only possible with lens baby or of course Tilt Shift. 3. one click on camera – long exposure (about 2 seconds) and two fires of flash on that exposure. A couple of you are right now! 1. Used an auto white-balance setting, but it may have been confused by a unique situation. 2. I used NOTHING that wasn’t mentioned, including no Vaseline or pantyhose or special lens. 3. Canon 5D Mark II does not have a multiple exposure function. Instead of creating your own guess try guessing who got it right! I’ll post the explanation soon!